chilly.domains Review 2019: Is chilly.domains a Good Hosting? chilly.domains is a website hosting provider based in Austria. Independent tests certify it at 100% uptime hosting availability. 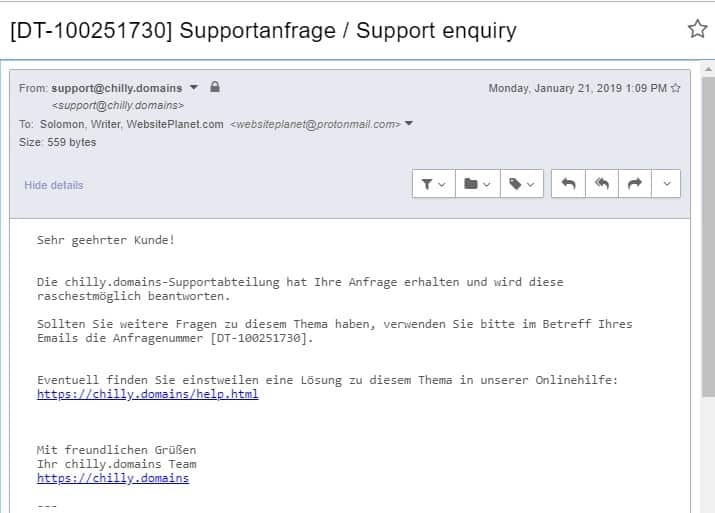 chilly.domains is an Austrian company that began its operations in 2003 but since 2013 has been under the management of ICANN-accredited registrar Ledl.net GmbH. The veteran hosting provider has been at the forefront of the Austrian web hosting sector with its well-rounded hosting packages, SSL certificates, email hosting, and domain name registration services. The user-friendly chilly.domains website is available in two languages: English and German. These hosting services run on high-performance servers housed in a data center located in Vienna, Austria. The hosting provider owns its data center infrastructure and its network is directly connected to the VIX (Vienna Internet Exchange), guaranteeing high availability. It’s therefore quite surprising to note that this vendor has been plagued with unending server issues for years. There are times when the servers can experience downtime for weeks at a time. Unfortunately, users often have to contend with servers that stay down longer than they’re up. Furthermore, though the vendor claims to provide unlimited bandwidth, there are soft limits to data transfer. To counteract this, there’s a risk-free overuse feature that ensures customers are notified when they exceed the set resource limits before their accounts begin to accrue extra costs. On the upside, chilly.domains has included daily malware scans, a security feature that keeps client data safe and free from computer viruses, spyware, and malicious programs. chilly.domains also offers daily data backups stored on two redundant RAID6 systems and on two LTO-4 tape drives, therefore improving availability and ensuring your website files, databases, and emails are safe and accessible. Backups are secured and stored for at least seven days. That said, it’s important to note that the backup service will cost an extra one-off fee payable when you’re subscribing to this vendor’s hosting plans for the first time. This hosting firm prides itself on offering a 99.9% uptime guarantee. However, it’s not uncommon for customers to now and then experience significant downtime. The vendor’s maintenance schedule can sometimes be somewhat haphazard, to the detriment of its customers. chilly.domains hosting solutions are quite cheap, especially if you factor in the features-to-price ratio. What’s more, the prices scale well from one plan to the next. There’s no free domain registration included in any of the packages, except for the all-inclusive chilly All-in-One plan. In addition, the vendor does not charge to set up your website on its servers. Its hosting prices are listed in Euros and only one billing cycle is offered — a one-year term. However, chilly.domains does offer a 30-day money back guarantee with no questions asked. To get in touch with chilly.domains, the vendor has made available several options: telephone, email, or a contact form on its website. Disappointingly, there’s no ticketing system or live chat. On top of that, the customer support is said to be available 24/7, yet my attempts to contact them bore no fruit — likely because support is only available in German and I emailed them in English. The only reply I got from them was an automated email response promising to respond to my queries “as soon as possible.” That said, the hosting provider’s knowledge base is fairly detailed and answers a good number of the basic questions customers are likely to want answers for. chilly.domains seems to have what it takes to deliver reliable hosting solutions for businesses in Austria and Germany. However, the vendor’s greatest setback might be its poorly scheduled server maintenance events as well as its unresponsive customer support. Wondering how chilly.domains stacks up against other Web Hosting companies? Enter any other Web Hosting company and we will give you a side-by-side comparison.